My dog Valentino and I have been dog sitting today. 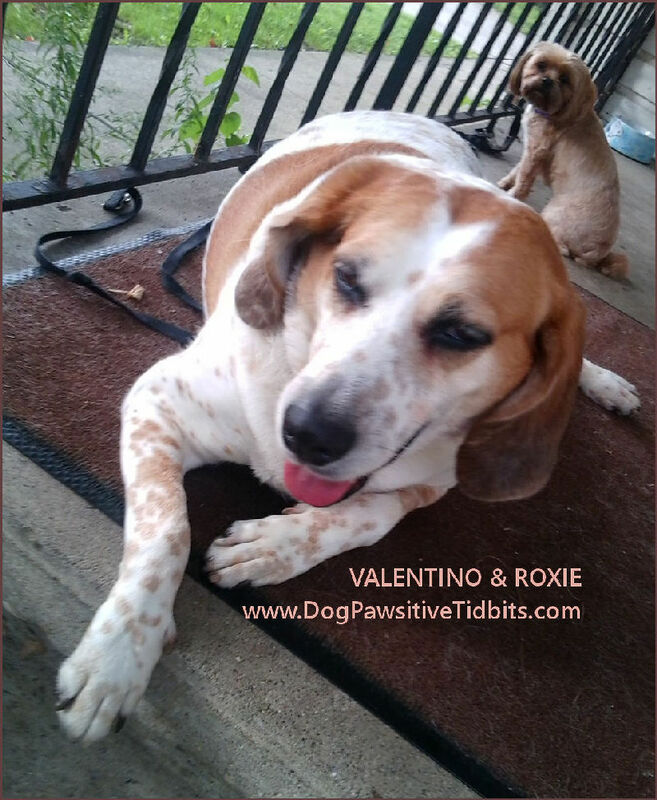 Valentino, Roxie, and I have walked the neighborhood together, shared meals and treats, and spent time sitting on the front porch too. These two are dog pals through and through, having spent plenty of time together the past year or so. The dogs play together, getting along just fine, while respecting each other's need for alone time too. Until today I had not seen Roxie show an interest in Goldenrod. Valentino has long been a fan of munching on the leaves of these golden flowers. Having done my research, I've learned they have healing properties for dogs just like they do for humans. Today as Valentino munched on a stalk of Goldenrod hiding amid other foliage, Roxie insisted she wanted some too. He wasn't too sure he wanted to share with her! I am enjoying dog sitting today. Next week I will be dog sitting for a co-worker while he and his family vacations. I will probably have more stories and dog pictures to share. Sitting with dogs today was the inspiration for a new paw print creation for my Zazzle store. I may use it to document my dog sitting as well as my dreams for a little dog sitting and dog walking business of my own. For sure I will be inspired to add another journal or two or more to this collection. 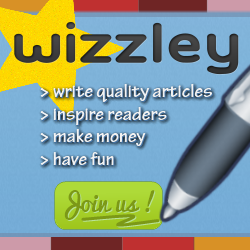 Disclosure: As a Zazzle designer I may earn from purchases made via links in this article. One day, not so long ago, I said goodbye to my dog Tidbit. The next day I re-read Go, Dog. Go! by P. D. Eastman. Some, including Eastman, may find it a bit strange that I would choose to pull Go, Dog. Go! off the bookshelf to read while mourning the loss of my dog Tidbit. Understandably so. Nonetheless, this book I have treasured over the years became a part of my healing—once I was able to permit its humor to prevail over my tortuous trail of tears. My time with my dog Tidbit (fourteen years to the day) seems to have whittled away a little less quickly than does the pace of the children’s book. Even so, as my girl dog went from being a little dog to a big dog, we enjoyed just as much pleasure as that which abounds on the pages of this treasure of a dog book for kids. Go, Dog. Go! is classic Eastman, a gem of a book for early readers. The page by page building of word phrases has kids learning to read new words with each turn of a page. But of course, you and I know that it is the dogs who have stolen the show and have our children turning the pages for reading the rest of the story. 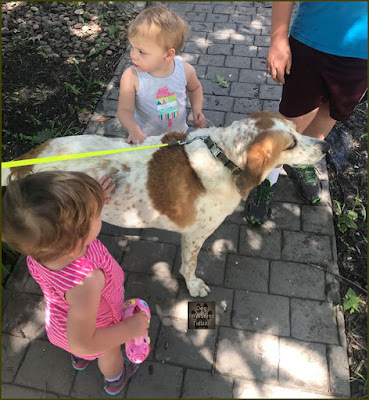 From the tip of the hat of “Dog” on page one to the male yellow beagle and the female pink poodle on the last page, dogs of all colors and kinds are found on the go; party animals delighting children with rhythmic reason. In the re-reading of Go, Dog. Go! I did smile at the sweetness of the “courtship” of the yellow dog and the pink pooch throughout the book. Of course, the dogs rode off into the sunset together as they said good-by to their reader. 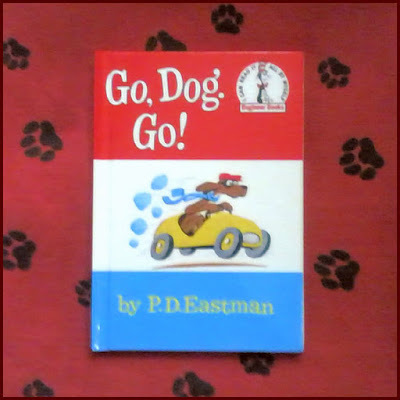 P. D. Eastman managed to get a bit of a relationship lesson in there for his young readers. I do enjoy books for kids that entertain as well as teach. For my dog Tidbit and I there were fourteen years of sensational sunsets. And while I am now unable to enjoy days with her, I am happy that our relationship was one of a love like none other I have ever experienced, canine or of the human kind. I and my dog Tidbit continue to share the fun times as well as a life lesson or two with my readers. We share our Dog Pawsitive Tidbits, dog books for kids of all ages, dog training tips and toys, and there is sure to be a sunset or two for you to view. Our time together is Tidbit’s legacy and I shall continue to share her pure sweet sunshine with my readers. For now it is just a bittersweet “So long!” to my girl. I find that the re-reading of books for kids is often quite enlightening. Have you read the children’s book, Go, Dog. Go! as a child, and again as an adult? Is there another children's book that you read and enjoyed as both a child and as an adult? Go! Get yourself a copy of this dog book for kids of all ages! Valentino is an incredibly kid-friendly dog with a gentle spirit. 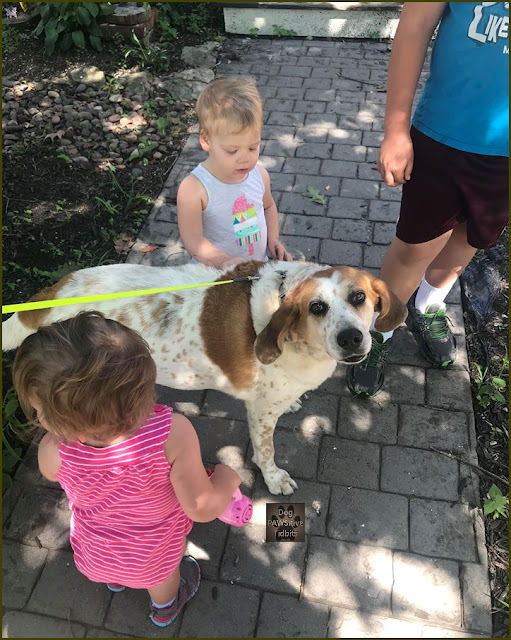 My hefty hound stands still to enjoy the tender-handed patting from the wee ones next door. When the father of the children took a picture of the group, my dog Valentino gently turned his head in the direction of the camera. Read about dog breeds for kids of all ages!